Narrated by Sir David Attenborough, this film follows the teams at the Natural History Museum as they replace the iconic dinosaur skeleton cast with a real blue whale skeleton. Over the last two years, the BBC's science strand Horizon has been behind the scenes at London's Natural History Museum, following the dramatic replacement of the iconic Dippy the Dinosaur skeleton cast with the real skeleton of a blue whale - the world's biggest animal. Narrated by Sir David Attenborough, this special film follows the teams involved in what has to be one of the world's most unique engineering challenges. 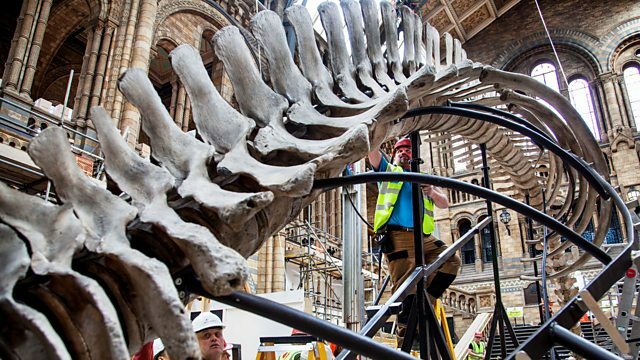 Replacing Dippy is brave and bold - it is the first thing visitors see when they enter the grand Hintze Hall, but the Natural History Museum is changing, and the installation of the colossal blue whale skeleton is the start of a new chapter. The largest animal ever to have lived, blue whales were driven to the brink of extinction by hunting and were the first species humans decided to save, telling an inspiring story of hope for the natural world.